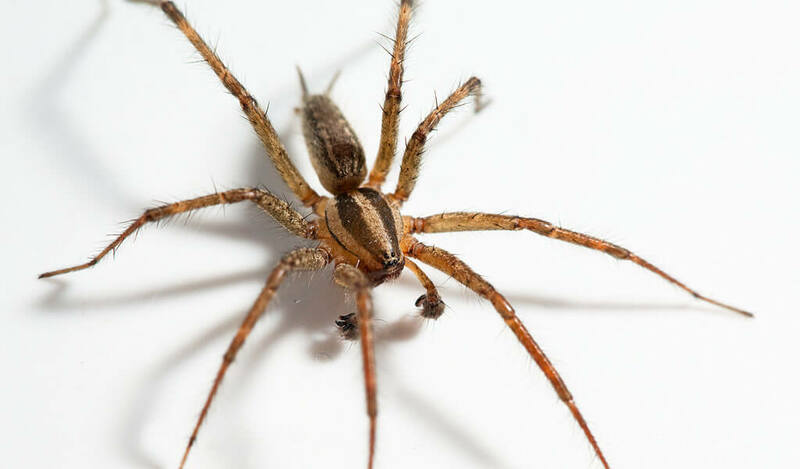 While camping, hiking or living off-grid it’s likely that you will encounter a variety of spiders in the wild and, sometimes, even in your home. Despite the urbanization of many areas, many species of spiders, particularly venomous ones, still manage to survive and thrive across America. While most arachnids are harmless and useful in culling pests, some can be dangerous and cause excruciating pain, and even death. This guide identifies five of the most venomous spiders in North America, listed from the most to least potent. Get familiar with them to better deal with and avoid these dangerous critters. This is thought to be the most venomous spider in North America. It can be found in Arkansas, Nebraska, Kansas, Oklahoma, Louisiana, Missouri, Kentucky, Tennessee, Mississippi, Alabama, Georgia, Ohio, Indiana, Illinois and Iowa. Identification: Its distinctive brown color isn’t its only telltale feature; look for a dark violin-like shape on its head that extends to its back, with the tip pointing to the abdomen. That’s why its other names include the “Violin” and “Fiddleback” spider. Another unique feature of the Brown Recluse is that it only has six eyes set in pairs, instead of the usual eight of most other spiders. This spider is quite small, with its body measuring only ¼ to ¾ inch body length, with a ½-inch leg span. 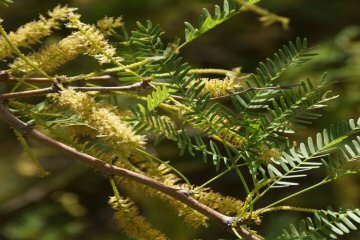 While they’re rare, its bite can be highly potent, with the venom potentially rotting away skin and muscle tissue. Close-up of the Brown Recluse. 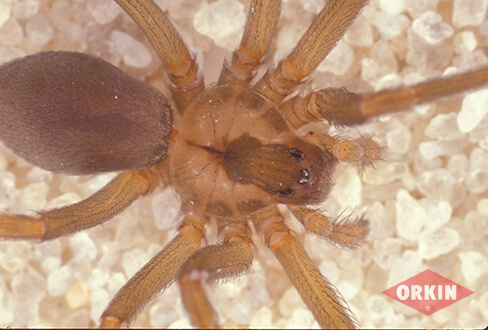 Note the distinct violin-like shape on the head of the Brown Recluse, and the paired 6 eyes (Orkin.com). Habitat: Fortunately, as its name suggests, this spider is very reclusive and is rarely encountered. They tend to live away from humans and like to live in dry areas with little to nonexistent airflow. 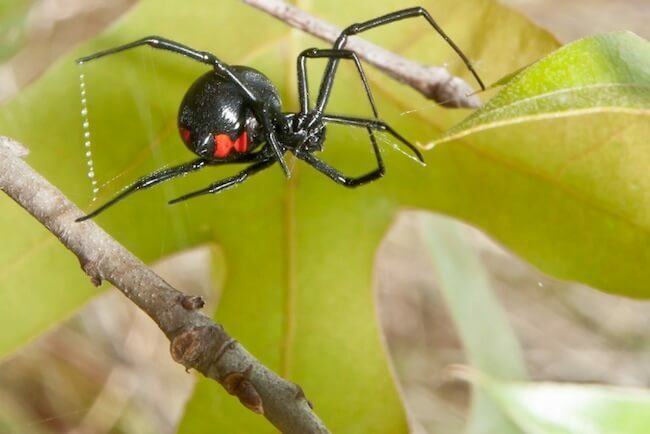 The Black Widow is found in all 50 states, but is less common in the Midwest. The Black Widow’s bite is rarely fatal, but causes excruciating pain that can last for several days. 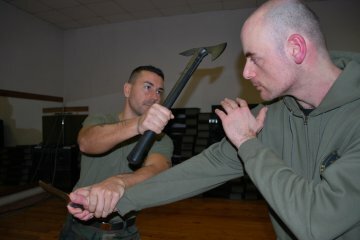 The bite can be fatal to small children and the elderly. Some victims report that the bite causes muscle spasms, followed by the most agonizing pain they’ve ever experienced. Identification: A venomous spider made famous in pop culture, the Black Widow looks sinister. Apart from its trademark glossy black color, the Black Widow’s distinct feature is its bright-red hourglass shape on the underside of its abdomen. The females are aggressive only if disturbed and if they feel their eggs are threatened. Fully-grown female Widows can grow up to ½-inch body length. Black Widow or not? Look for the bright-red hourglass (TheAtlantic.com). Habitat: Most times they make their webs at ground level in garages, hollow stumps, under rocks, crawl spaces, cluttered basements, outhouses and stacks of firewood. Minimize clutter in your garage or outhouse (if you have one) and basement, and closely inspect your firewood to avoid getting bitten or bringing the spider into your home. 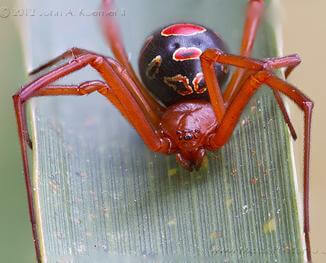 The Red Widow is actually a cousin to the Black Widow, and is likewise venomous. Like its cousin, only the females bite and its venom is a neurotoxin that causes extreme pain, sweating, heightened pulse, muscle cramps and spasms and sometimes uncontrollable vomiting. The bite is very painful, and the can be lethal for those who are very young or very old, and especially dangerous for patients with heart ailments. Identification: This spider is predominantly red in color, a black abdomen with red spots bordered by yellow lines and the rest of its body a bright reddish-orange. Females grow to a body size of about ½ inch of body size when mature. This Widow’s underbelly has one or more tiny red marks, but not an hourglass shape. Its head and legs are reddish in color. The equally-dangerous cousin to the Black Widow (SuwanneeAdventures.com). Habitat: Its favored habitat consists of rosemary plants, palmettos, scrub oak and other shrubs in central and southeast Florida. Found in the western states, Hobo spiders are commonly found in Washington, Oregon, Idaho, Montana, Wyoming, Utah and Colorado. 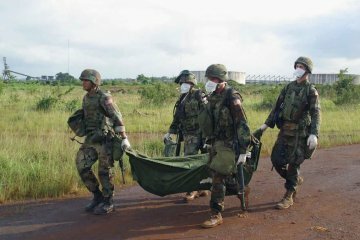 Their venom is potent and the bite causes a blister to form at the site, usually after 24 hours. 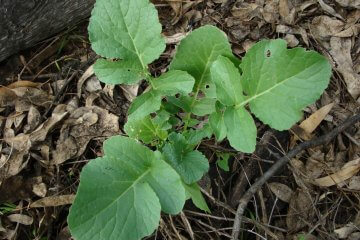 The blister then breaks open and turns into an ulcer, oozing liquid in 1-2 days. Symptoms include a painful headache, weakness, fatigue, nausea, abnormal eyesight, and short-term memory loss. Identification: Measuring ⅓- to ⅔-inch body length with a ⅔ to 2-inch leg span, and mostly brownish in color, the adult Hobo has several chevron-shaped marks on its abdomen. The male’s mouth has 2 large palpi (mouth parts that look like boxing gloves) while the females have a larger abdomen. Habitat: They favor dry and arid environments, so areas bordering on desert or sparse land may be home to these spiders. Note the palpi that look like boxing gloves on this adult male Hobo Spider (AnimalCorner.co.UK). The Tarantula is probably the largest among the venomous spiders in America, and can be found in most parts of California, New Mexico, Arizona, Louisiana, Texas, Arkansas, Missouri, Colorado, Kansas, Utah, Oklahoma and Nevada. 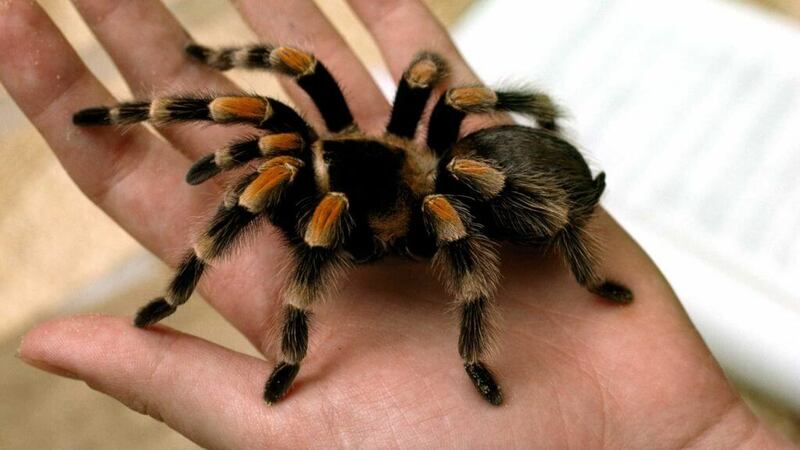 All Tarantulas are poisonous. Their bites aren’t usually fatal but are extremely painful, with the pain lasting for days. Despite their dangerous nature, some people have managed to keep them as exotic pets. Identification: With bodies that measure 2¾ to 4 inches, the Tarantula can grow to be up to almost a foot in length, including its legs. Apart from its dark brown color, its large size, large fangs and hairy body make it stand apart from its more venomous kin. Habitat: Tarantulas thrive in grasslands, deserts and dwell in caves, cliffs, trees and even banana and pineapple crops. These venomous spiders are spread far and wide across the U.S., but despite their numbers and great range, spider bite fatalities average a low of 4 people per year. The trick to avoid getting bitten by these creatures is not to antagonize them and give them a wide berth; stay away from areas that can house their nests. Keep basements, crawl spaces, attics and garages clean and remove any clutter while wearing thick gloves. Should you encounter these spiders, don’t get in their way and block their escape route; like any other animal, they’re afraid of you and become more aggressive when cornered. Before you put on your shoes or boots, turn them upside-down and shake out any critters that may have crawled in for warmth. If in the wild, don’t disturb their nests or tamper with their eggs. If they happen to nest in your attic, basement or any place in your home, call a pest control expert. When it comes to your family’s well-being, their professional fees are well worth the price of safety and peace of mind.